On her latest album, Björk leaves heartbreak behind and shares a dazzling world of love and perfection. Björk's 2015 album, Vulnicura, was a dark, painful experience for the artist. The emotionally draining heartbreak Björk was chronicling (inspired specifically by her breakup with artist Matthew Barney) was tangible, and while it resulted in an impressive collection of music, it's a relief to see that the artist has moved on and found the love and happiness she seems to be reveling in on her latest album. If Vulnicura is the breakup album, Utopia, her ninth studio album, is one of new love. Not that this is bouncy, bubbly pop music – this is, after all, Björk we're talking about here – but in her unique, artistically knotted musical world, this is the sound of unfettered joy. Co-produced by Arca - known for his work with Kanye West and FKA Twigs – Utopia can be dense stuff, but repeated listens will bear out not only a sympathetic ear for the artist's struggles and subsequent rebirth but also a familiar, Björk-like vibe. Utopia has a unique sound within Björk's discography yet manages to live comfortably alongside the rest of her albums (its closest sonic equivalent is probably 2001's Vespertine). 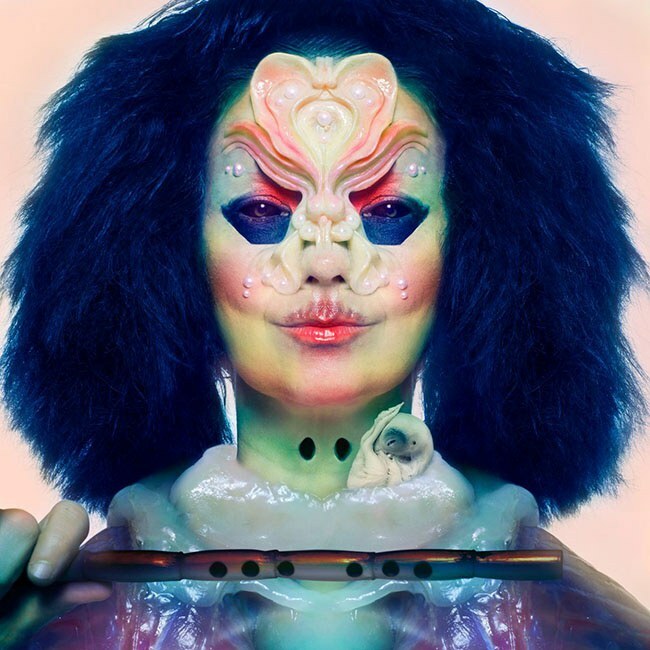 Largely eschewing a lot of the contemporary beats she manages to infuse into her music, Björk approaches Utopia with a somewhat airier, unmoored feel, with layers of flutes making up a bulk of the instrumentation. Kicking off the album with a combination of birdsong and futuristic effects, "Arisen My Senses" is an appropriate primer for what's ahead for the next 72 minutes. Light, fluffy chords crash all around while Björk sings an unabashed ode to love and lust: "Just that kiss / Was all there is / Every cell in my body / Lined up for you / Legs a little open / Once again." The next track, "Blissing Me", is another raw expression of sexuality and newfound love, complete with the very real feeling of geeking out over similar obsessions: "Is this excess texting a blessing? / Two music nerds obsessing." Again, the contrast between this album and Vulnicura is strong, and a welcome reassurance for anyone who was hoping Björk would abandon the dystopia of that previous album. Amazingly (and reassuringly), Björk's voice still sounds the same as it did when she belted out "Human Behaviour" nearly a quarter-century ago. Her elastic vocal performance, coupled with her unusual style of sounding out each syllable with great deliberation remains intact, which is a remarkable feat in itself. It's especially impressive to hear her voice cut through the layers of noise and distortion of chaotic tracks like "Losss" and "Sue Me," a couple of rare examples where Utopia reaches a sort of atonal fever pitch. But on much of Utopia, Björk takes a relatively gentle approach to the music. On "The Gate", her vocals manage to simultaneously soar and tiptoe alongside the sparse, experimental arrangement that almost sounds like futuristic chamber music. "Tabula Rasa" seems to take on the same musical qualities, but on a somewhat smaller scale, making it sound almost like "minimalist Björk". As with most established artists' definitive albums, there are "epic" songs. On "Body Memory", the album's centerpiece and longest track (clocking in at nearly ten minutes), Björk struggles with and eventually embraces the harmony between primal sexuality and the enormity of nature while a unique mix of beats, flutes, strings and a 60-piece choir provide accompaniment that's both soothing and dissonant. "Oh, how to capture all this love," she sings, "And find a pathway for it / Like threading an ocean through a needle / River through a keyhole." Balancing this out is the instrumental, interlude-type track "Paradisa," which gives the album's ubiquitous flute chorus an opportunity to shine on its own. Songs like the aforementioned "Body Memory" provide Björk the opportunity to sing not only of the joys of love and intimacy but also to feel at one with the beauty of the world all around us - creating, in essence, a utopia within our living world. "Imagine a future and be in it," she sings on hypnotic, ethereal closing track, "Future Forever". "Feel this incredible nature, soak it in / Your past is on loop, turn it off / See this possible future and be in it." The world is a tough, frustrating place to be in 2017, but Björk's familiar voice and uncanny knack for creating dazzling, unique worlds can be a welcome tonic for our ills.